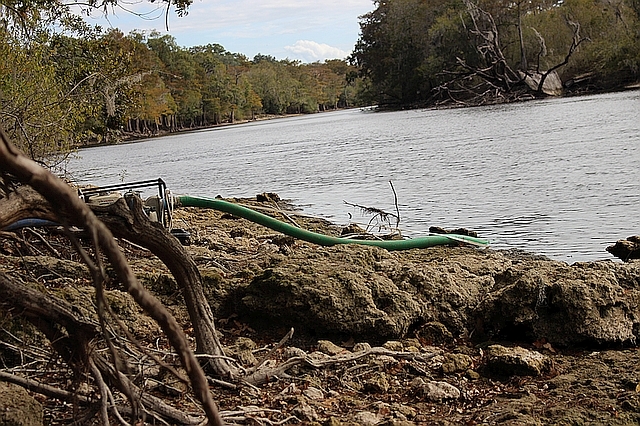 Water Levels are very low due to lack of rain but Sabal Trail pipeline is still pumping 100’s of Thousands gallons or water from the protected Sante Fe River. 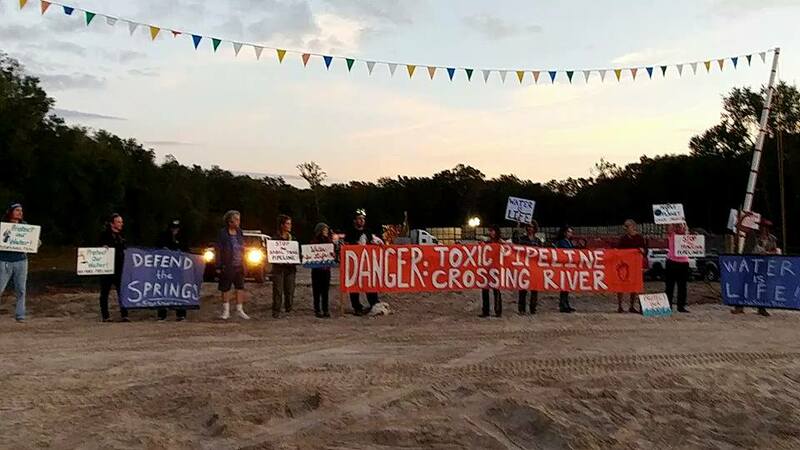 This pumping began over a week ago after Sabal was denied further access to water at already FERC approved Beachville Mine due to owner being informed as to what they are doing with the water – use it to test and push pipe after HDD drilling UNDER the Sante FE River for over 2900′ Ft.
Water Protectors from Sacred Water Camp and Water Is Life Camp joined forces to slow the progress by direct action as they did these actions people on recon snapped the photos you see below. 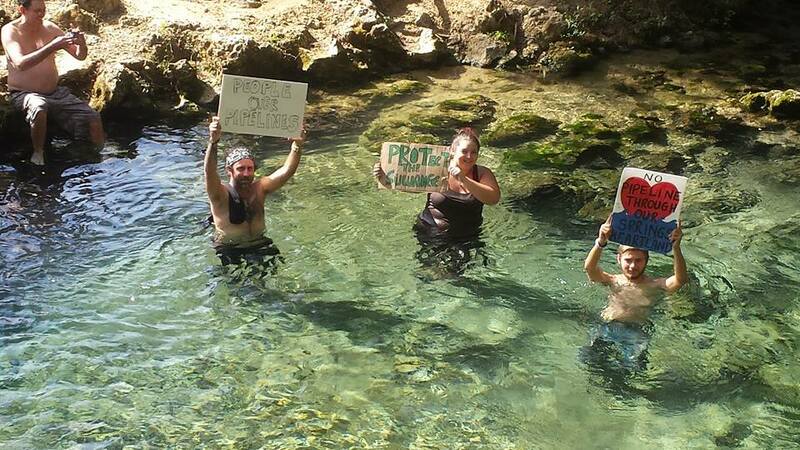 Please join us or support us in these actions to protect our water – Water is Life! All info and videos can be found on the above Facebook page – note important info in pinned post including directions to Sacred Water Camp. Suwannee County is a very large aquifer re-charge and dis-charge area for the Floridan Aquifer that is now very threatened. 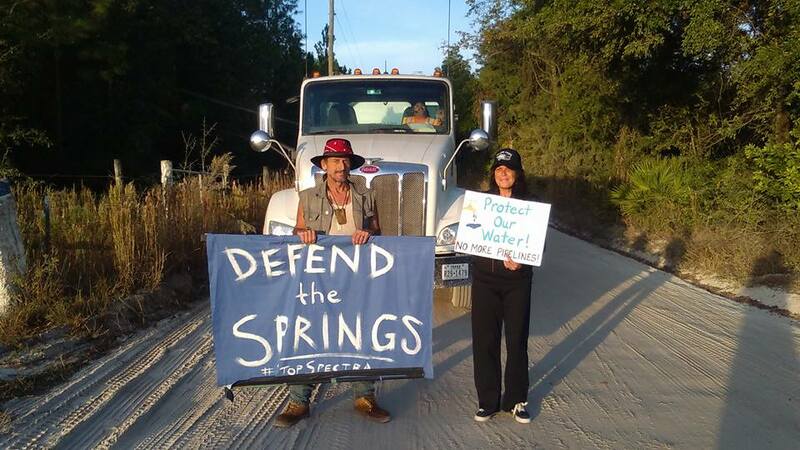 Suwannee County is also the home of 1,000’s of fresh Water Springs – Windows to the Aquifer with many 1st magnitude springs threatened by this fracked gas pipeline for export to other countries. Not to mention the wetlands that play a vital part of water filtration. Sabal Trail is dumping sludge, getting leaking equipment stuck — destroying close to 1,000 acres of wetlands. Please report any violations that you may see and again join us or send support – see Facebook page please and pinned post in group.